Thanks to Banggood I own two Sonoff basic devices. While the original and intended use is waiting for the local Hackspace to reopen, I thought I would take a look at hacking options. The Sonoff community is strong, and there seems to be plenty of support for Sonoff devices. Is it worth hacking Sonoff? The short answer is Yes, the long answer is below. For me, the pros outweigh the cons. And for a lot of you as well as the hacking community is strong and there are plenty of examples of Sonoff devices being used in an awesome way. BE AWARE: Sonoff device backup will only work with the specific unit. Currently, there is no way of sharing the backup file between the devices. Make sure that you create the backup file for each Sonoff device you own. Before you open a device like this, remember to only program it using power from the FTDI programmer. DO NOT USE MAINS to power up the chip for programming. Guys at Sonoff has been nice enough to expose all the pins needed to flash the software. To make the job easier, I have added 5 header pins to the board so I could use jumper wires when hacking Sonoff devices. Pay attention to the board orientation to connect the correct wires between your device and FTDI converter. Once you have the hardware ready, we have to set up the hacking environment. I will cover the setup of Windows 10 as it’s the most troublesome. Now you are ready to play with esptool software. Download the tool and unpack it to a folder. Bring up the cmd/PowerShell in that location. 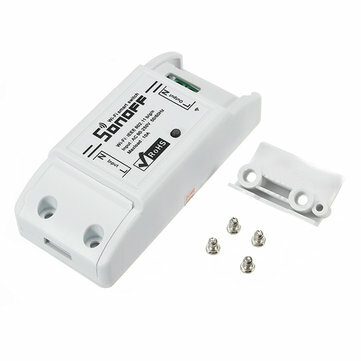 Connect the Sonoff device and power it up while holding the built-in button for 2-3 sec. You will be able to make changes to the bootloader now. Your first action should be a backup. Check the COM port connected via device manager. Once the backup is done, you will notice a new file present in the folder. It’s the image1M.bin (or whatever you named it). This is your recovery file. Keep it safe. If you delete the file, you won’t be able to restore the original firmware. If you want to delete the firmware completely and prepare it for the custom software. You can restore or flash a custom software. Just place the file in the same folder as the esptool.py file. IwIP Variant: "v1.4 Higher Bandwith"
Now you can put your board again into a flash mode (hold the button for 2-3sec when powering up) and flash a custom code. I will be writing a better code especially made for the Sonoff basic, but for now feel free to interact with a web-based interface. For now, I used the code I made for DIY Smart Socket as it suits my needs for testing. You can download the modified version at the bottom of the article. An excellent firmware, developed by Adrian and available on www.smartnydom.pl (most of the content is available also in English). AFE Firmware is best for ESP8285 and ESP8266 devices which are not made by Sonoff’s ITEAD. I talked about this in detail in my ESP8285 4-way relay tutorial. If you use ESP8266, don’t worry – the principle is the same, just download the correct version for your chip. This firmware aims to use the exposed dev pins on Sonoff devices for the purpose of adding the sensors and modules. Tasmota firmware works best with Sonoff devices as the options are tailored for each product released by ITEAD. There is already a tutorial about the Tasmota and sonoff devices, and you can take a look at the implementation and flash it to your device. It’s very rewarding to hack your own Sonoff device. You learned new skills, you can integrate it with your automation systems. The biggest advantage for me is the ability to link it to any device you wish almost directly. The consumer-based systems have a very limited scope and aim to work with the most popular solutions. On top of that, 5 years down the line there is no warranty that home automation systems owned by you will still be in use and supported. Having total control over a device you own is the best!